Love Varnish: 31 Day Nail Art Challenge - Galaxy Nails! Hi loves! Woah, I am very excited for today's theme - Galaxy Nails! 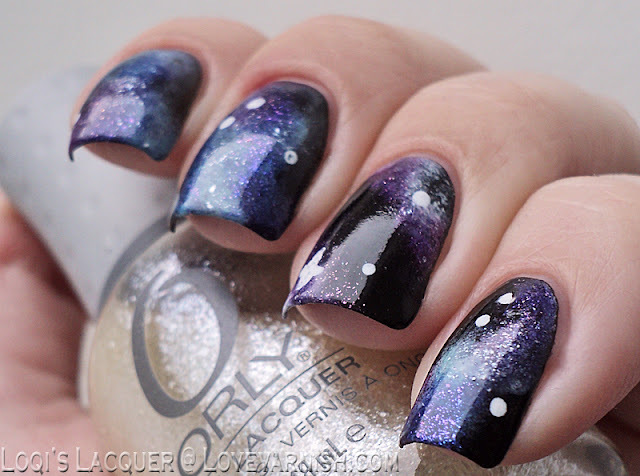 I never even tried this manicure style and now I did, I want to try some more haha. Because a lot of bloggers are having fun with the 31DNAC through out September, I browsed some of my favorites for inspiration for today. 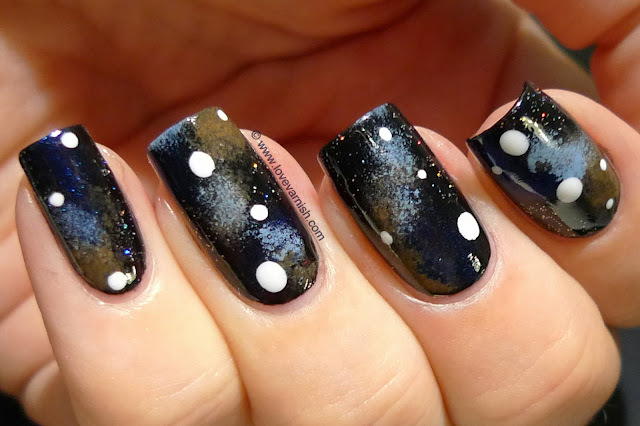 I found my perfect example over at Chalkboard Nails, I immediately loved the cool toned look of these and started to look for polishes to recreate this look. My base is 1 coat of a england Camelot, a lovely black creme. Then, after it dried, I first sponged China Glaze Dessert Sun (brownish color). My second sponge color is Essence Hard To Resist (dark, sparkly blue), and the third is Bondi Blue Skies (soft blue color). I filled in the unsponged parts with China Glaze Fairy Dust. The white dots are H&M Love at First Sight. 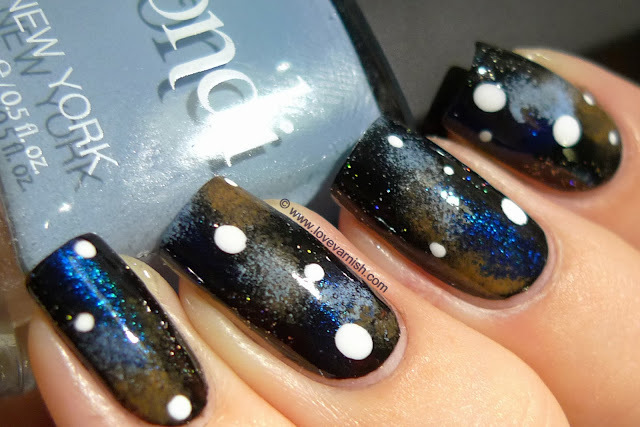 I really like how these came out and was very proud when the first thing my boyfriend said after looking at these was "hey, it looks like a galaxy!". Mission accomplished! 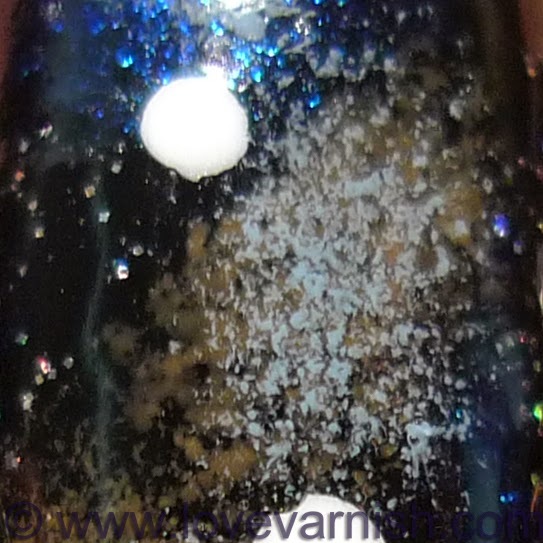 What do you think of my first attempt at galaxy nails? Tell me in the comments! Hi Guys! 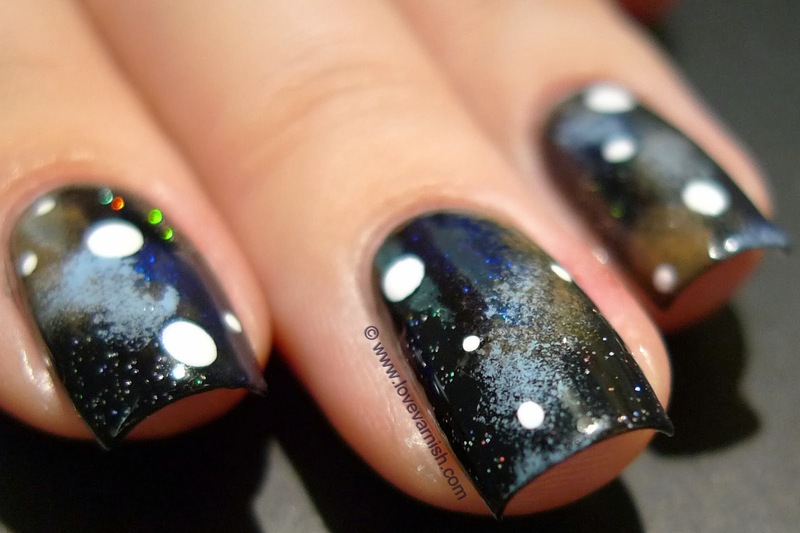 I really like galaxy nails, but I hardly ever do them so I was really excited for today's challenge! I abselutely love what Deborah did, such a nice combination of colours! I myself went for a combination of blue and purple. I started with a base of Wet 'n wild Black crème. 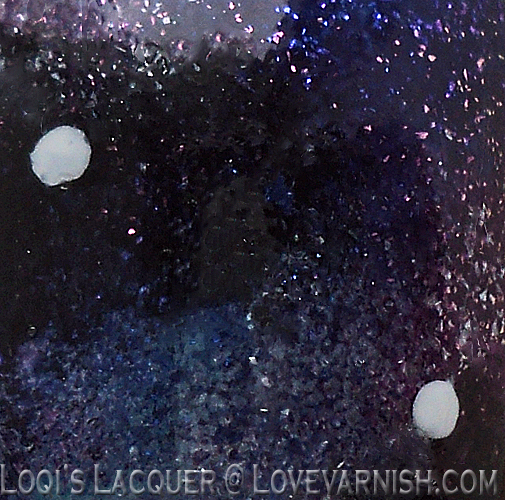 Then I sponged some nebulah like areas with P2 Virgin (a very transparent white) to make the next colours more vibrant. Then I sponged P2 Call me (purple), China Glaze For Audrey (Tiffany blue) and Herome Frankfurt (marine) over the edges of the white, leaving some bits untouched. To finish it of I sponged over all the polishes with a glass flecked polish in corresponding colours: Orly Winter wonderland (white), Orly Lunar eclipse (blue) and Kiko 278 Violet orchid microglitter (purple). As a last touch I added some stars with white and Voilà! 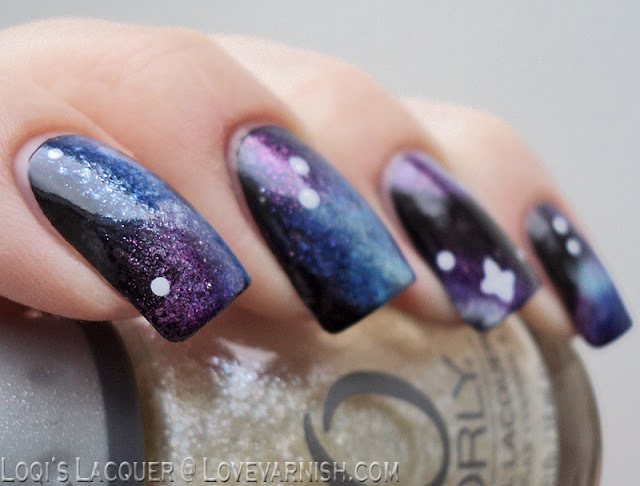 I hope you guys like our galaxy nails! And see you soon! Stay tuned for challenge day 20: Water Marble Nails! 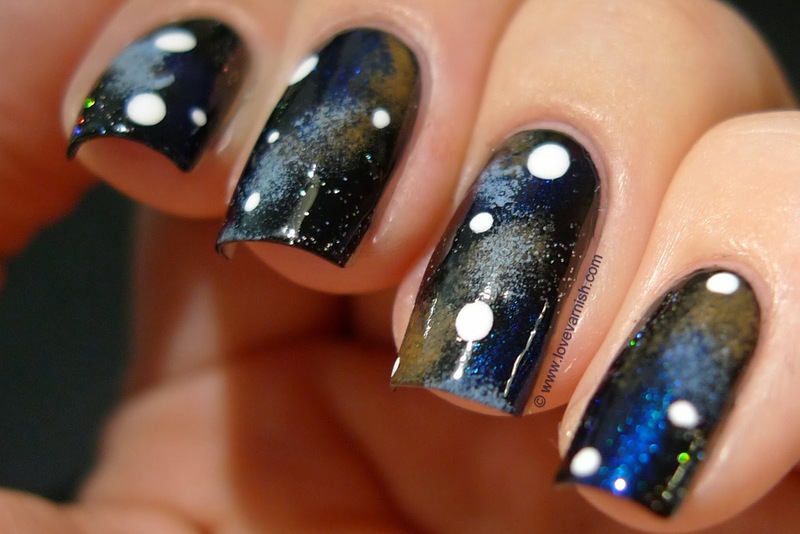 I love galaxi beautiful manicure and manicure! Thanks Natalie! Glad you like them :). Fantastic job, both of you! Much more subtle than my approach, which is just to throw up glitter all over the whole thing. Beautiful! Love them both!!! Galaxy Nails are so awesome!! 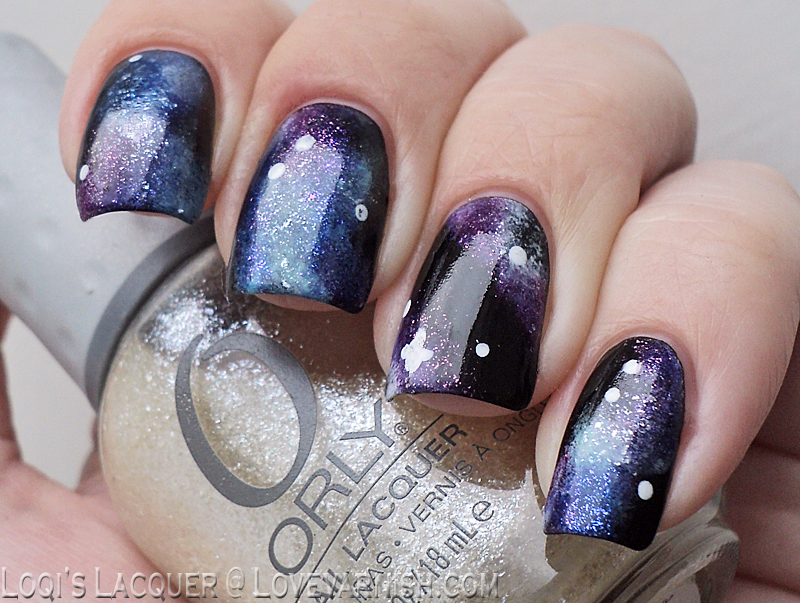 Galaxy nails never get old, huh? :) They're gorgeous! But glitter ♥. Thanks so much Sarah! They are :D and thanks dear! Especially if you never did them before LOL ;-) I'll try more often now. Thanks!